Promoting American Naval Heritage, one idea at a time. 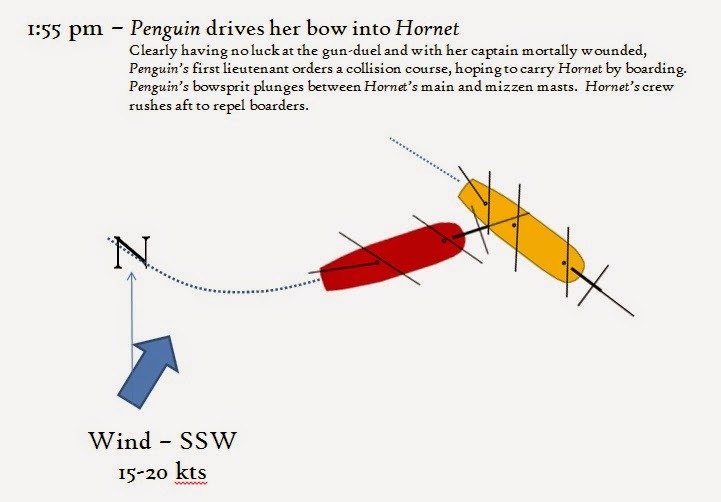 By now I know you’re all brimming with anticipation of tomorrow’s announcement – tomorrow being PENGUIN DAY, the 200th anniversary of Hornet’s capture of HMS Penguin in the last regular naval action of the War of 1812. We plan to use the anniversary to make several major announcements about the USS HORNET Project, one of which is particularly fitting for the occasion. But to jump the gun a little bit, and give you all some food for thought in advance of tomorrow’s anniversary – here is the event, again, in the words of Hornet’s own crew. Like my last entry I must credit Mr. McKee with his excellent book “A Gentlemanly and Honorable Profession” for the journal excerpts. 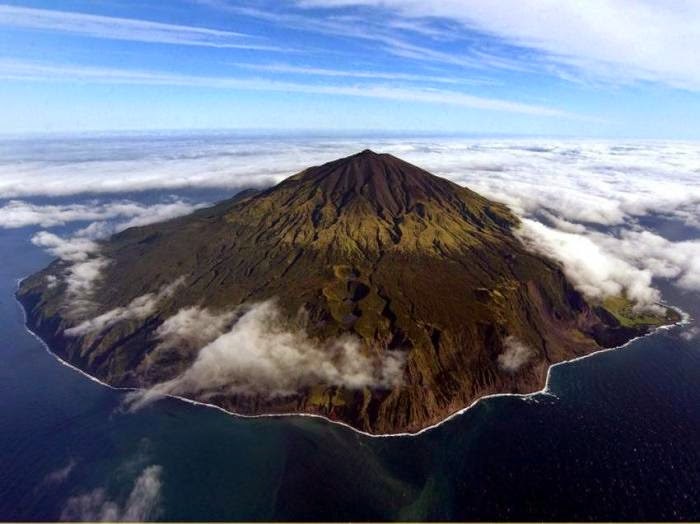 By March 21, Hornet had arrived in the vicinity of the squadron rendezvous - the remote South Atlantic island of Tristan da Cunha. Yep - way the hell out in the middle of nowhere. At the time fewer than half a dozen people lived there, and thanks to the infrequency of Royal Navy ships in the area, American privateers and Navy ships alike began making the islands a regular stopping point. Officers and crew waited anxiously for their first vision of land since leaving New York, but a strong misty gale had sprung up and Captain Biddle ordered the ship hove to in order to avoid an unwanted landfall in low visibility. Finally the weather abated and at 5 pm on the evening of March 22nd Hornet’s lookouts spotted Tristan's distinctive volcanic peak. Exactly what you would expect a volcano in the middle of the ocean to look like. By half past 8 the next morning, Hornet arrived a mile off the island’s north side and launched her first cutter to scout the watering place. The boat returned at 10 am, greeted with a sharp cry from the forward lookout. "We hove to and was getting dinner (it was duff day) while she was running down. The duff was hardly swallowed when the drum beat to quarters. Duff - once a week, and much anticipated. Ask any Navy Sailor when burger or pizza day is - they know what's important! "This required but a few minutes, and all was ready for action and every eye watching the stranger. He soon luffed to on our weather quarter about pistol shot off, hoisted the British flag and gave us a gun. This we did not notice, waiting for him to shoot ahead more. "He now gave us the first broadside, and as soon as their guns flashed ours were in operation, and in five minutes I perceived the blood running from his scuppers a stream; and, as he almost stopped firing, our little captain ordered us to cease. "The enemy, thinking we were disabled, renewed his fire, and of course we soon convinced him of his mistake. He then, as a last alternative, ran his bowsprit between our main and mizzen masts, with the intention to carry us by boarding. "I was stationed with the first lieutenant in the third division on the quarterdeck (three after guns on each side) and was now commanding this division, the first lieutenant having been severely wounded at the commencement and carried below. The jib halyards being shot away, the foretack was hauled down to veer the ship. The enemy was now past us, and all hands called to repel boarders. We were then hand to hand, and the enemy were soon driven back. We were now on the enemy’s bows, and it required all the exertions of our captain and officers to prevent our men from boarding them. Had they gone, the enemy would have suffered very much. Their men were now (hearing the cry from us to board) running below and left their first lieutenant alone on the forecastle. Many muskets were levelled at him, but were prevented by our officers from firing on so brave a man. He then asked our leader, the second lieutenant, Newton, the name of the ship and was answered “U.S. Sloop Hornet” when he waved his sword and walked aft. "Our ship, in shooting ahead, carried away his bowsprit, tore away all our mizzen rigging, and the enemy lay across our stern. Our captain was standing on the arms chest aft, speaking to them, when their foremast fell along the lee waist. The marines in the foretop clung, with their muskets, to the rigging as the mast fell, and, as soon as down, jumped forward, fired, and wounded our captain, the ball passing through his neck. They undertook to rake us with their bow guns, then opposite our stern. I was standing in one of the stern ports (being open), looking directly at them and only about twelve feet off. We were then all hands aft to prevent their boarding, and I certainly expected to see many of us fall at this fire. Had those guns been well directed, many of us must have been killed; but fortunately, at this very moment, the sea lifted our ship’s stern, and the balls went under the counter in the water. "Our ship now came round on the other tack, and I played my division of guns into them, raking them fore and aft. They again cried quarters, and our captain ordered us to cease. "When our little captain was wounded a man from one of my guns pulled off his old checked shirt, tore it in strips, took hold of Captain Biddle, and wound this round his neck. He then holding his bandage himself, was asked by one of our officers if he thought himself much hurt, when he replied, “No, no, give it to the damned rascals!” This shot was fired, recollect, after they had once given up. After the action was all over, the doctor came to the captain (who was still at his post, holding onto his neck) and asked him if he would go down and have his wound dressed? The captain answered that, if he had got through with the rest, he believed he would go, and then we heard that the ball had passed through his neck and out through his coat collar behind. "One of our men on board the Penguin picked up a hat on the quarterdeck in which he found a man’s head that had been shot off. He very deliberately pulled the head out, looked at it saying, “Matey, you don’t now require a hat,” put it on his own head and dispatched the other overboard. I have seen him with this hat on often in New York. The sailors were also looking out for the legs amputated, that they might get some shoes and stockings, as the doctor did not take the trouble to pull them off. One very remarkable occurrence, and that was one of the English midshipmen, a young man who sat on the wardroom table, smiling and talking and joking with one of his wounded shipmates near him who had lost a leg, while the doctor amputated one of his legs, without the least emotion. When it was off, “Never mind,” said he, “Bond (his messmate wounded), we will soon get on sticks and have fun with the girls yet.” This poor fellow was on crutches when removed on board the Tom Bowline with the other prisoners, took cold, and had his leg amputated a second time by their own surgeon. Poor fellow, he died. Bond I often met at St. Salvador, Brazil." 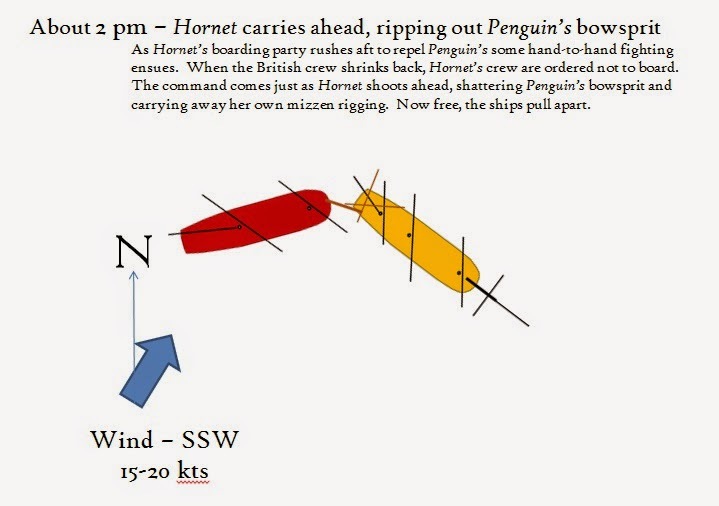 Hornet kept Penguin towing astern all night and into the next day. Crews worked to salvage what they could from her shattered wreck. Captain Biddle ordered a carved penguin cut from the ship’s side as a gift for his father. Carpenters plugged more than 100 shot holes beneath the waterline in an attempt to slow her flooding as other crewmembers stripped her hold of stores and supplies. Damaged as she was, with only one mast and so far from a friendly port, there was no hope of bringing her in as a prize. By the second night the wreck had been stripped, and at 2 am on March 25th, Biddle ordered her scuttled and the tow cable cut. As the sun began to rise only a few hours later, two sail were spotted approaching from the northeast, and by all appearances these were men of war as well. 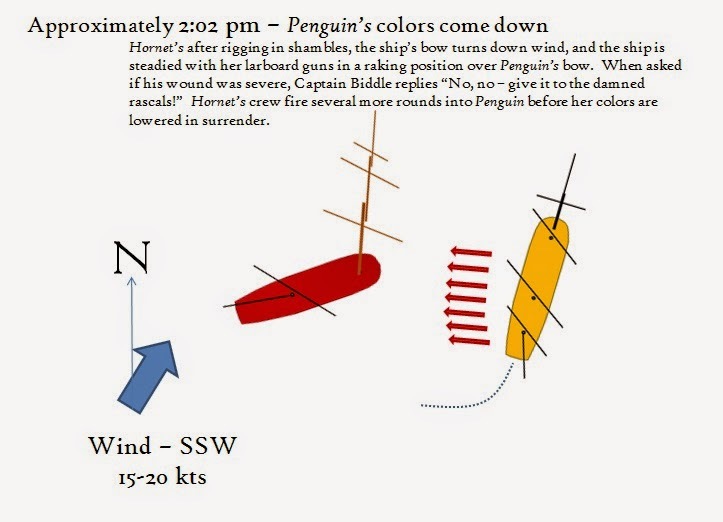 Biddle ordered Hornet cleared for action just in time to make out the distinctive signal flags of Peacock’s coded number. Warrington had arrived, returning to the island after having been driven off by a gale some days earlier. 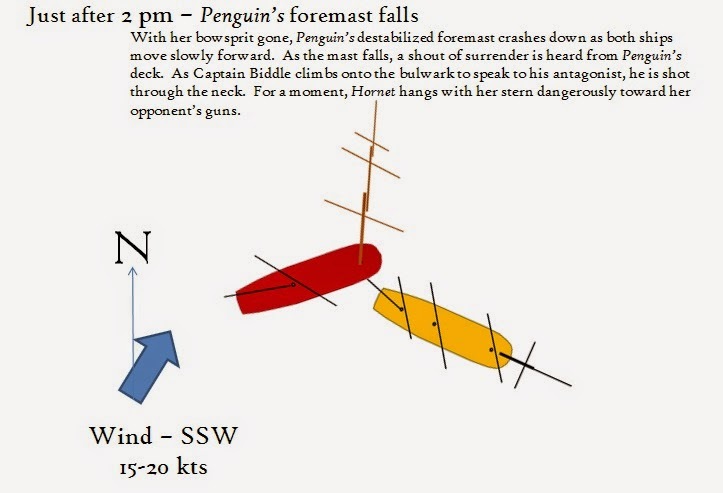 Taking stock of the situation on resuming command of his fragment of the squadron, Warrington ordered the prisoners from Penguin’s crew into Tom Bowline, which would sail for Brazil to parole them before proceeding home with the good news of Hornet’s victory. 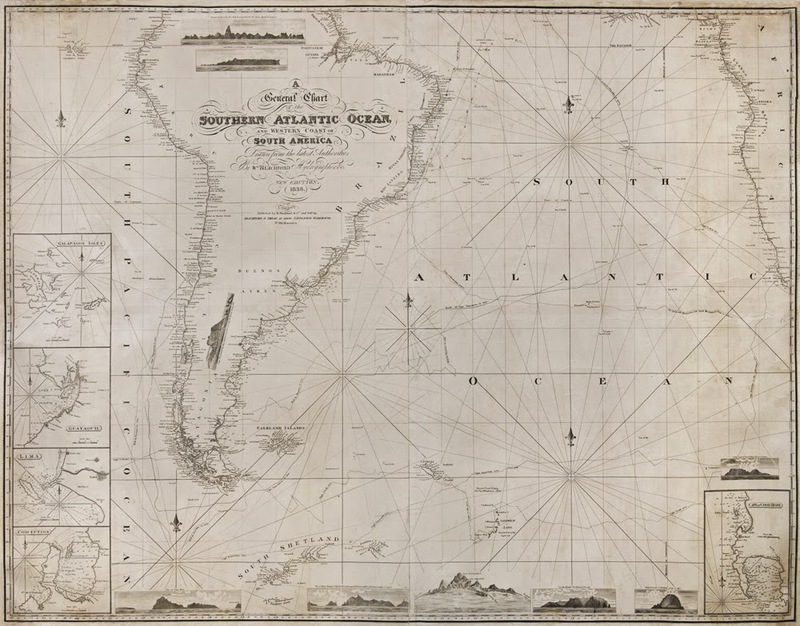 Hornet and Peacock would remain at the rendezvous and await the arrival of Decatur in President before proceeding west around the Cape of Good Hope and into the Indian Ocean. U. S. Sloop Hornet, off Tristan d'Acunha, March 25 1815. Sir—I have the honor to inform you, that on the morning of the 23d inst. at half past ten, when about to anchor off the north end of the island of Tristan d'Acunha, a sail was seen to the southward and eastward, steering to the westward, the wind fresh from the S. S. W. In a few minutes she had passed on to the westward, so that we could not see her for the land. I immediately made sail for the westward* - and shortly after, getting in sight of her again, perceived her to bear up before the wind. I hove too, for him to come down to us. When she had approached near, I filled the main-topsail, and continued to yaw the ship, while she continued to come down, wearing occasionally to prevent her passing under our stern. At 1, 40 P. M. being within nearly musket-shot distance- she hauled her wind on the starboard tack, hoisted English colors, and fired a gun. We immediately lulled too, hoisted our ensign, and gave the enemy a broadside. The action being thus commenced, a quick and well directed fire was kept up from this ship, the enemy gradually drifting nearer to us, when at 1- 55m, he bore up, apparently to run us on board. As soon as I perceived he would certainly fall on board, I call cd the boarders, to as to be ready to repel any attempt-to board us At the instant, every officer and man repaired to the quarter-deck, where the two vessels were coming in contact, and eagerly pressed me to permit them to board the enemy ; but this I would not permit, as it was evident, from the commencement of the action, that our fire was greatly superior, both in quickness and in effect. The enemy's bowsprit came in between our main and mizzen rigging, on our starboard side, affording him an opportunity to board us, if such was his design; but no attempt was made. There was a considerable swell on, and as the sea lifted us ahead, the enemy's bowsprit carried away our mizzen shrouds, stern davits- and spanker boom- and he hung upon our larboard quarter. At this moment, an officer, who was afterwards recognized to be Mr. McDonald, the 1st Lieutenant- and the then commanding officer, called out that they had surrendered, I directed the marines and musketry men to cease firing; and - while on the taffrail asking if they had surrendered- I received a wound in the neck. The enemy just then got clear of us, and his foremast and bowsprit being both gone, and perceiving us wearing to give him a fresh broadside, he again called out that he had surrendered. It was with difficulty I could restrain my crew from firing into him again, as he had certainly fired into us after having surrendered. From the firing of the first gun, to the last time the enemy cried out he had surrendered, was exactly 22m. by the watch. She proved to be his B. M. brig Penguin, mounting sixteen 32 lb. carronades- two long 12's, a 12 lb carronade on the top-gallant forecastle, with swivels on the cap-stern, in the tops. She had a spare port forward, so as to fight both her long guns of a side. She sailed from England in September last. She was shorter upon deck than this ship, by two feet- but she had a greater length of keel, greater breadth of beam, thicker sides, and higher bulwarks, than this ship, and was, in all respects a remarkably fine vessel of her class. The enemy acknowledge a complement of 132 ; 12 of them supernumerary marines- from the Medway, 74.— They acknowledge, also, a loss of 14 killed and 28 wounded ; but Mr. Mayo, who was in charge of the prize, assures me that the number of killed was certainly greater. It is a most pleasing part of my duty to acquaint you, that the conduct of Lieuts. Conner and Newton- Mr. Mayo- acting Lieut. Brownlow of the marines, sailing-master Romney, and the other officers, seamen, and marines, I have the honor to command, was, in the highest degree, creditable to themselves, and calls for my warmest recommendation. I cannot indeed do justice to their merits. * Biddle’s report says he stood westward, while the ship’s log records her standing eastward to glimpse the stranger – a much more probable course given the winds. The error too, is probable and even understandable, when the reader remembers that the author was recovering after being shot through the neck two days before. Hornet’s voyage was not yet complete, and we’ll follow her on the remainder of her cruise in later posts. For now, stay tuned, and at 2:02 pm eastern tomorrow – the 200th anniversary of Penguin’s surrender, I’ll have the privilege to post our announcements about the new Hornet. A major announcement... leading up to another. Keep on waiting, dedicated fans, it's coming - PENGUIN DAY is right around the corner. That's when we run out the big guns, so stay tuned. The International Yacht Collection and their parent company, Trinity Yachts, have joined the HORNET Team as our first corporate sponsors! 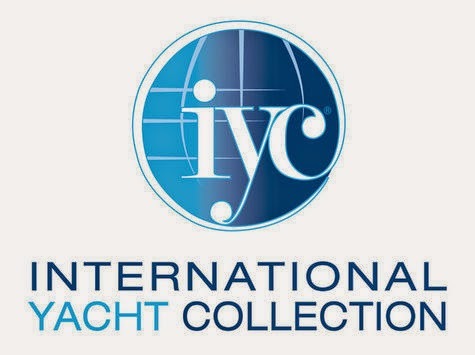 IYC and Trinity will be hosting a cocktail fundraiser for the USS HORNET Project at their pavilion at this year's Palm Beach International Boat Show - Friday, March 27th 2015 at 6 pm. This will be an exclusive, invitation only event, so stay tuned for photos - which we'll hope to get online the next day. We'll be rolling out figurehead Triumphant for the occasion, and honoring several of HORNET's other new sponsors - for which announcement you'll have to wait until Penguin Day. Many thanks are in order to Bob Saxon, President of IYC for his vision in stepping aboard with IYC as HORNET's first major corporate sponsor - our hats are off to you, sir! More to follow... on both the present day project and the historical HORNET - keep checking back! As the historical Hornet slipped southward 200 years ago today, and as we today await the approach of “Penguin Day” (March 23rd) and with it a major announcement about the USS Hornet Project, a little back story is in order. I’ll be posting again in the next couple of days with some more lead-up discussion about the present-day developments, but for now, I hope you will sit back and enjoy a good sea story, straight from the pens of Hornet’s own crew. While our digitalization project continues, I’ve borrowed the following journal transcripts from one of my favorite books, “A Gentlemanly and Honorable Profession” by Christopher McKee – for anyone who hasn’t picked up this gem I highly recommend it. It is perhaps the single most detailed and insightful book on the early Navy’s officer corps, and an absolute essential for anyone with an interest in the period. 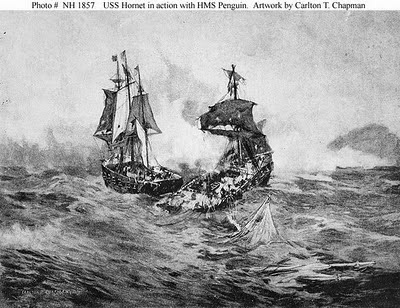 Hornet’s first days at sea in 1815 were tumultuous. Sailing in the midst of a fierce winter gale from the northwest, she departed New York in company with the sloop Peacock and store-ship Tom Bowline – running straight past the British blockaders in the midst of a strong winter gale from the northwest. The weather continued to deteriorate, and before long lookouts couldn’t make out Peacock, last seen to the west, an estimated 20 miles away. Biddle ordered lights hoisted aloft and rockets fired, still no sign. After heading that direction and not finding any sign of her or Tom Bowline, he shaped his course to the southeast, heading for the rendezvous at Tristan d’Acunha, alone. "In the evening a flying fish flew onboard. It was an uncommon large one. I heard some of our oldest sailors say it was the largest they ever saw. It was between eighteen and nineteen inches in length. Those fish are exceeding fine when fried – something similar to perch. "For the last four or five days a large whale has been sporting about the ship, particularly in the evening, near the setting of the sun, his enormous snout rising sometimes above the waves with a fountain spouting through the aperture in the skull. Sometimes his huge curved back appeared like a rock in the ocean, and at other times he would spread his tail like a fan and lie on the surface of the water for hours. He frequently comes so near the ship that he wets our decks fore and aft, spouting higher than the maintop." What's going on with HORNET? Apologies to our dedicated web followers for the silence of the last several months - yes, we've read your emails! Rest assured we've been hard at work behind the scenes, paving the way for a new push which we hope will bring Hornet closer to fruition. 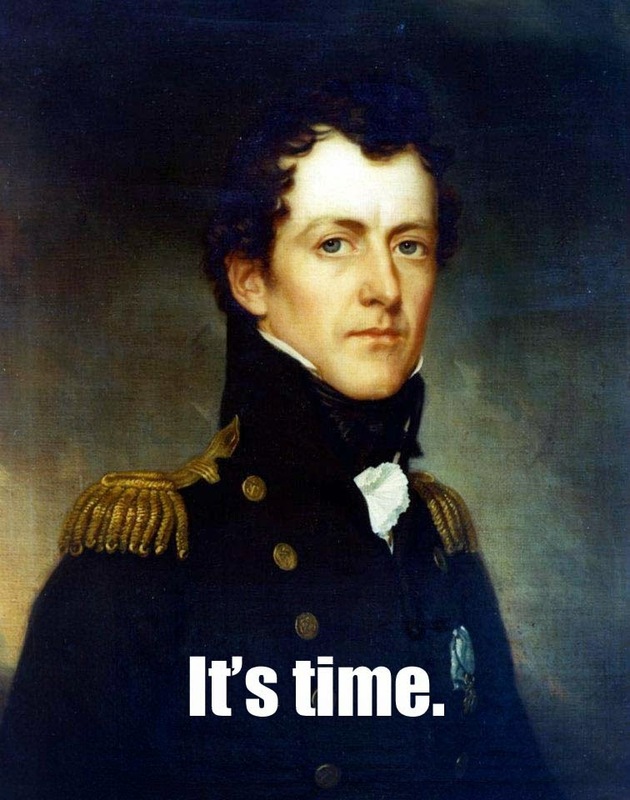 200 years ago today, Hornet was cruising southward on her fourth and final cruise in the War of 1812. Under the command of intrepid Master Commandant James Biddle, Hornet had only recently escaped from a grueling 17-month blockade that trapped the ship in New London, Connecticut. Now unleashed on the ocean, and after running the British blockade not once, but twice, Biddle raced his tiny ship southward toward a remote rendezvous and an ambitious new objective. Of course, by this point in the cruise, and unknown to anybody on board, a peace treaty had been ratified ending the war less than two weeks before. But slow communications would keep the battles going in distant waters for months to come. Biddle's first stop was a remote island rendezvous in the South Atlantic, where he planned to join forces with other units of a squadron under command of Commodore Stephen Decatur and proceed to raid British shipping in even more distant Southeast Asia. Hornet had sailed from New York in late January with USS Peacock - a ship named for the British vessel Hornet sank in 1813 - but the two ships had been separated by bad weather only a few days out of port. Now Hornet was proceeding south alone, hoping to meet both Peacock and the frigate President at the first rendezvous. Naval history enthusiasts know what happened next. We're going to explore it in the days to come, and I think everyone will be able to appreciate the great historical parallel to what's to come in our efforts to build a new Hornet. More to follow, shortly - stay tuned. 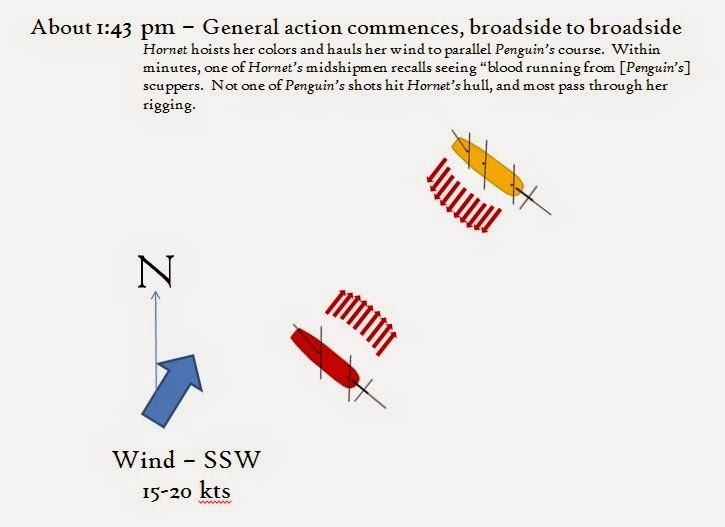 First of HORNET Deck Logs have been posted! 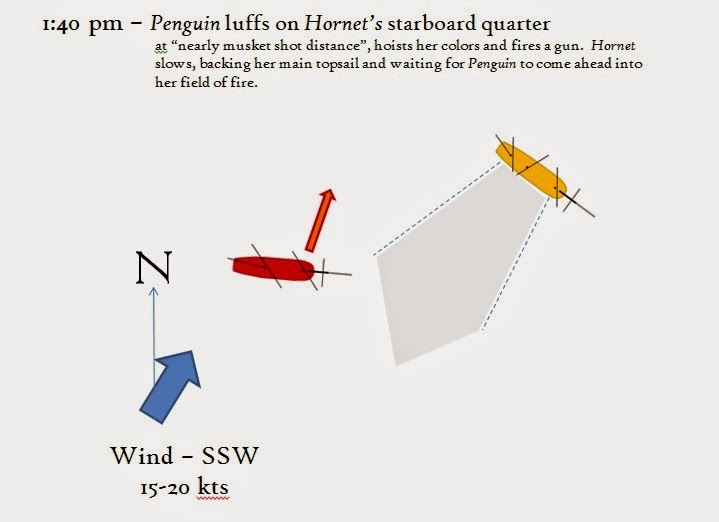 Preempting tomorrow's edition of The Pennant by a few hours, I'm pleased to announce that our volunteer researchers and our website managers have uploaded two of fifteen volumes of Hornet's deck logs preserved in the collections of the National Archives. Check out the product by clicking here. To date, the team has digitized nine of the fifteen huge volumes with Vol. 3 through Vol. 9 still being sorted and organized. Make no mistake - this is a huge deal. So far, those first nine volumes constitute more than 2,500 pages! So great work, guys - keep it up! So go check out the product of our volunteers' hard work, and enjoy the new material! If you're not sure where to start, the first entry in Vol. 1A is July 28th 1805 - and the launching of Hornet at Baltimore. The log goes on to detail the fitting out and first sail - remarkable stuff! Enjoy! 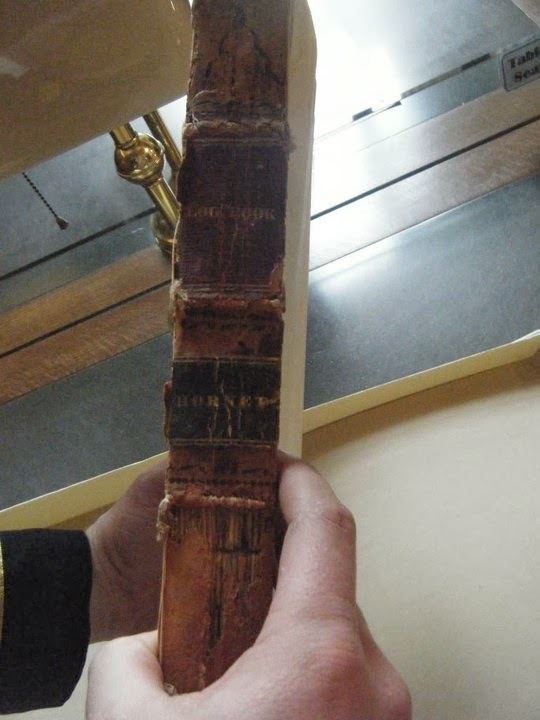 An NHS team of volunteer researchers has been working this week at the National Archives & Records Administration (NARA) main branch in downtown Washington D.C. Their mission - completely digitize all of Hornet's deck logs. 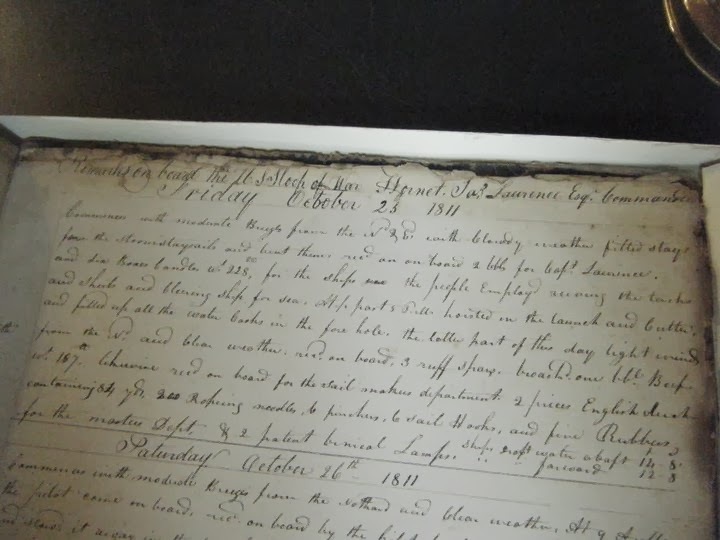 The logs, which are bound into 15 huge volumes encompassing an estimated 5,000 pages, cover nearly all of the ship's service - one of the most complete records of any ship of the period. 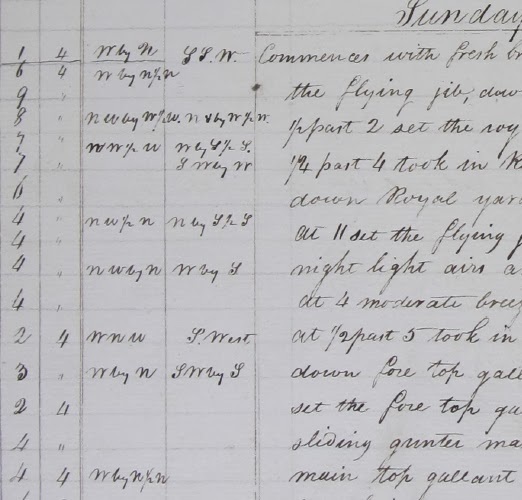 The intent of this new initiative is to make the actual records of the original Hornet accessible to a wider audience, and enable contributors to help transcribe and organize the information for easier use. The deck logs are a great place to start - because they are so complete, they provide the perfect framework over which to compare and arrange future research. After the deck logs, there are still hundreds of muster lists, official reports, official and unofficial journals, drawings and other papers in the NARA collection. The digitizing process is painfully slow. Volumes are set up in a lighted copy stand which allows a digital camera to capture detailed images of each page. One. at. a. time. Some pages are so frail that they have to be turned with thin rulers to prevent tearing. To expedite the photographic process and ensure continuity, all of the odd pages are photographed, then the volume turned around to shoot all the even pages. The database managers then organize the images into their proper order, and convert to PDF files. One of the smaller logbooks, showing deterioration. As the team completes each volume, it'll be announced in our weekly newsletter The Pennant. The immediate disposition of the PDFs - until our website is reworked to support the database - is still up in the air. Ideally I'd like to get them online somehow as soon as possible. In the meantime, anyone interested in helping to transcribe the logs should send an email to info@navalheritage.org and let us know - we're going to need all the help we can get! UPDATE: Of course I'm behind the curve on this - at the time of writing the crew has already completed scanning the first of 15 volumes, and is well on their way toward completing the sorting/formatting process. Standby for more - these guys are ON IT! 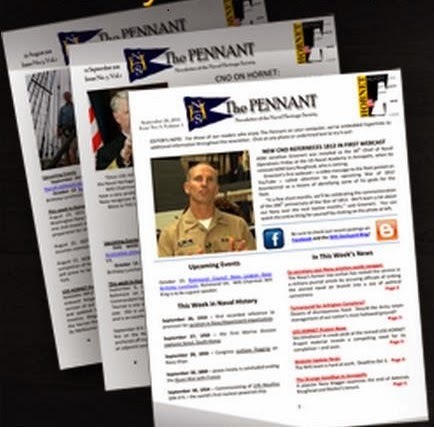 After nearly a year-long hiatus, I'm pleased to announce that our weekly newsletter - The Pennant - is returning to publication on Monday February 3. Editor in Chief Tim Everett and our new volunteer writers are gearing up for an excellent comeback edition, with top news and opinions from around the Navy and Naval History community. Readers can also expect several articles on the status of the USS Hornet Project - for which we've recently been bombarded by emails. For fans of our Naval Trivia column, the edition will also boast one of the most difficult trivia questions I've seen in a while. To compensate for the extra mental lifting, the winner will receive a limited edition Naval Heritage Society Hornet challenge coin. The newsletter will be distributed weekly by email in PDF copy, and remains totally free of charge. To subscribe, visit www.navalheritage.org and click on the "Hoist Your Pennant" icon in the upper left corner to enter your e-mail address. Check out NHS on Facebook!